The Lakeland Ledger gave Carlos Fermin the headline after this July 1993 game because Fermin gave his team the win. In the ninth inning of a tie game, Fermin knocked a hit that knocked home the winning run, The Ledger wrote. Fermin knocked in that game-winning run in his fourth season as a pro. He went on to play in two more seasons. He made AA, but didn't make it higher. 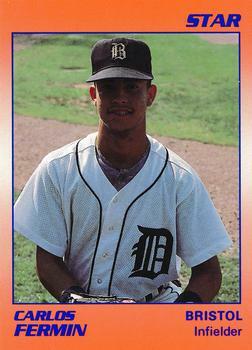 Fermin's career began that year, signed by the Tigers as a 16-year-old free agent out of his native Dominican Republic. Fermin's brother is major leaguer Felix Fermin. Fermin started that year with rookie Bristol. He got into 67 games, playing shortstop. He hit .222, with 15 RBI. He moved to single-A Fayetteville and high-A Lakeland for 1991, playing most of the year at Fayetteville. He went 3 for 7 in one April game for Fayetteville, leading to an extra-inning game-winner on a single and an error. Fermin played a shorter 1992 season between short-season Niagara Falls and AA London. In 43 games, Fermin hit just .162. He returned to Lakeland for all of 1993, getting into 86 games and improving his average to .252. He knocked a two-run single in a May win. Fermin then played 39 games at Lakeland in 1994, then 59 games at AA Jacksonville in 1995, ending his career. Fermin has since returned to the Dominican Republic and turned coach for the Indians. Fermin has served as pitching coach for the Indians Dominican Summer League team for at least 11 seasons, continuing in 2016.